When there are several plugin updates available, it would be handy to not have to do the update procedure step by step for each available update but all in one with a Button/Link "update all"
at the end of the procedure there should be summary shown e.g. "x plugins were updated"
@tsteur has made some progress on this, but it's not quite yet implemented. So currently very nicely we update all plugins when Matomo core is being auto-updated. The simplest and sufficient solution would be to have a button "Update all plugins". 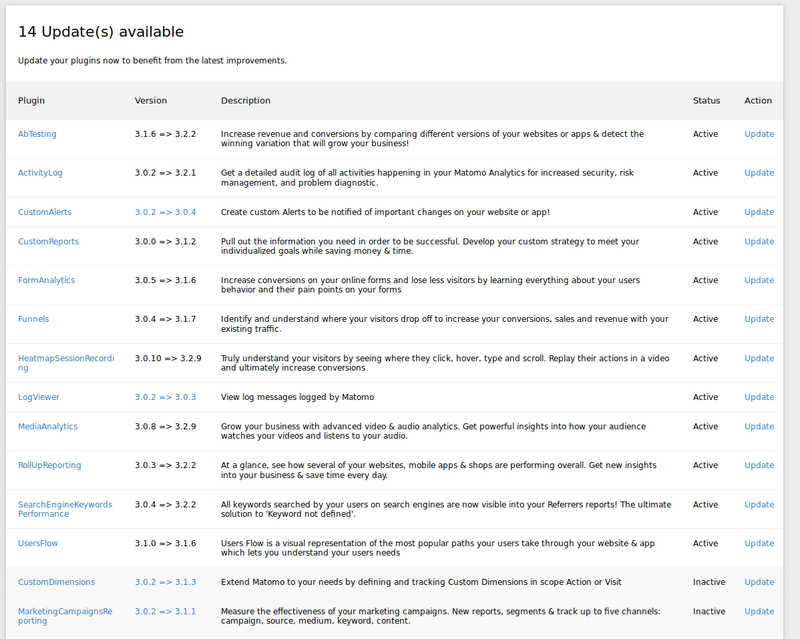 In this example (14 plugins to upgrade), it would save probably 5-7 minutes of time clicking and waiting a lot (because the nonce invalidates after each uninstall we have to reload the page listing all plugins). It would be good to have a message that clearly says "Downloading and updating all plugins, this will only take a minute..."